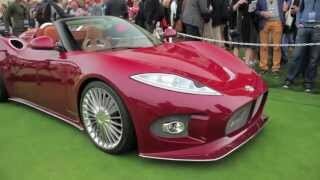 The Dutch supercar-maker Spyker has unveiled the Spyker B6 Venator Concept, a unique alternative in the High Luxury Sports sector, at the 2013 Geneva Motor Show. 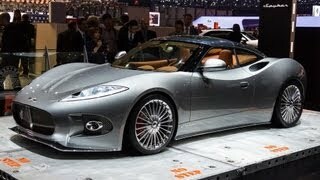 The Spyker B6 Venator Concept is a compact, 2-door mid-engine sports car that will offer the discerning driver of the highest standards a new choice, delivering a rare combination of heritage, design, performance and exclusivity. 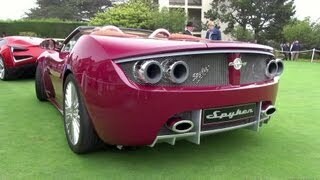 Designed by Victor R. Muller, Chief Executive Officer of Spyker, the B6 references Spyker models of the previous century with a V-shaped mesh grille and the 1903 Spyker logo harkens back to an era when Spyker built racers such as the amazing 60HP. The name “Venator” is Latin, meaning “Hunter” – a nod back to Spyker’s “Hunter” fighter aircraft of the early 20th century. 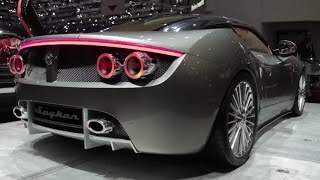 The B6 Venator incorporates several aviation inspired elements into its design, namly a aerodynamically shaped glass aircraft canopy, after burners type 3D LED rear lights and elegantly aggressive 19” TurbofanTM wheels in mirror polish finish. The car is powered by a mid-engine V6 with over 375 horsepower. The engine is paired with a six-speed automatic gearbox. A carbon fiber body and an aluminium chassis helps keep weight down to 1400kg. Interested Customers from Europe, the Middle East and Asia Pacific regions will be able to purchase B6 in early 2014. American customers will have to wait till late 2014. Price will be somewhere in the $125,000 to $150,000 range.